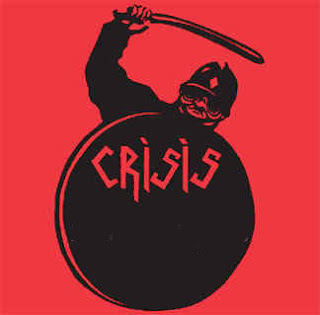 I was watching the news last night - sorry in advance for the rant - but I was increasingly annoyed by the overuse of the word "crisis". In a half an hour broadcast I counted 34 uses of the word. This is what wikipedia said a crisis means: "A crisis (plural: crises) may occur on a personal or societal level. It may be a traumatic or stressful change in a person's life, or an unstable and dangerous social situation, in political, social, economic, military affairs, or a large-scale environmental event, especially one involving an impending abrupt change." Granted some things warrant the use of the word - famine, war, oil spills, nuclear leaks, genocide. The Greek violent protests maybe, the war in the Congo probably. Some vague worries about Pork in Ireland being infected with bacteria that you'd have to consume in quantities so large that you'd die of your stomach exploding before you could expose yourself to enough bacteria to get a mild stomach ache - not a crisis. Gordon Ramsey's marriage? Crisis? I think not. It didn't help that the dour BBC delivery makes everything sound much more serious than they really are. My point is, if we use language like this for the most banal of events, how are we to recognize a crisis when it really happens? I call for an amnesty on the word. Very well said! Our society seems to be suffering from a severe case of melodramatic hysteria. Many of the issues that we're facing, I think, wouldn't be nearly as severe if we hadn't been whipped up into such a frenzied panic. It may sounds a little trite, but I think we could all do with sitting down, calming down, and having a cup of tea. Perfect example of something that might not be such a crisis, becoming the worst thing to ever happen - the "child abuse" case in Jersey earlier this year. This was reported as a series of horrific murders and yet now that the authorities have been given the time to actually investigate what happened, it turns out that not an awful lot happened (or so I have read). The human skull that they found turned out to be a tiny piece of bone... and then turned out to not be bone at all but some sort of plastic material. True we're heading for a not very nice time of it - retailers are losing profits, people losing their jobs and their homes, but considering this, I think a bit of responsible grown-up journalism wouldn't go astray. Yep, wholeheartedly agree, the BBC are rapidly heading the way of the tabloids and over on the other side they've gone for good. Less drama more fact that's what they should be concetrating on. Even if you turn the paper to the back pages there are "crisis's" there too. Chelsea for instance -Drogba in talks of moving to Inter Milan, Scolari admitting he gets nervous, losing twice at home in the league in a month and a stuttering Champions league campaign. Lets look at the facts - if Drogba leaves they still have the top scorer, Anelka, everyone gets nervous, they're still 2nd in the Premiership by a mega ...wait for it ... 1 point, and they are through to the knockout stages of the Champions league. Alfred Kahn, an economist in Jimmy Carter's administration was told not to use the word recession when discussing the financial situation to the american public for fear of worsening the state of affairs. Kahn decided to replace the word with another, Banana. Crisis, recession or financial meltdown either way this banana is going to shake the global economy and effect people from Tennesee to Tahiti so if you don't like bad news get some ear muffs or watch Nickolodeon. Wow! Go Daniel - say it like it is! But to fair, I don't think its about shutting ourselves off to the bad news. It's about not stoking the fires of hysteria. Refusing to hear the word "recession" or any other such word would be ridiculous. All I'm looking for is for the news to be reported in a calm objective way. The more drama that is injected by the press, the worse the situation will become. The fact is that people (including me) are scared - making everyone more scared is not going to make things better, its going to make things worse. So yes, let's here the bad news loud and clear, but let's leave out the melodrama.